If you would like to carry these wood collectibles in your shop, contact us for order and price information. 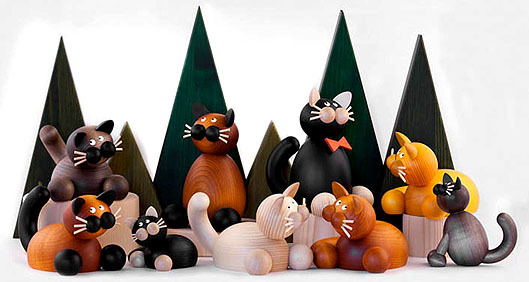 We have a passion for the traditional wood handicrafts of the Erzgebirge region of Germany. We scour the small villages, always looking for new and unique items. On a recent trip to Germany, we discovered a collection of handcrafted animal figures, including cats, penguins, seagulls, chickens, owls, and bears. 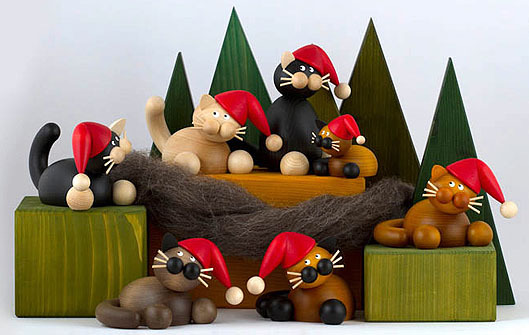 Some of the wood animal figures come with whimsical Christmas hats that will brighten your home during the holiday season. The cats, penguins, seagulls, chickens, and owls are from Drechslerei Torsten Martin, and several of these designs have been awarded the coveted “Tradition and Form” design prize from the Verband Erzgebirgischer Kunsthandwerker und Spielzeughersteller e.V. 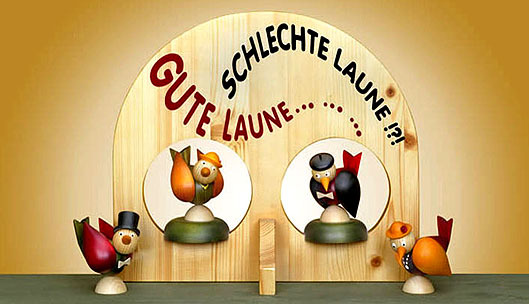 The good luck bears are from Günter Reichel Kunstgewerbliche Holzwaren. Each cat figure comes in 3 poses: sitting, on the lookout (tail in the back and up), and contented (tail on the side). Uncle and aunt cat figures show the front legs. Christmas cats have Santa caps. 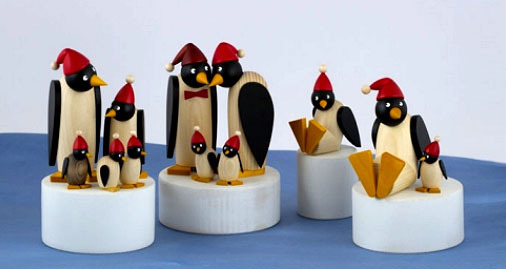 These delightful penguin figures, handcrafted from wood, bring a smile to everyone. 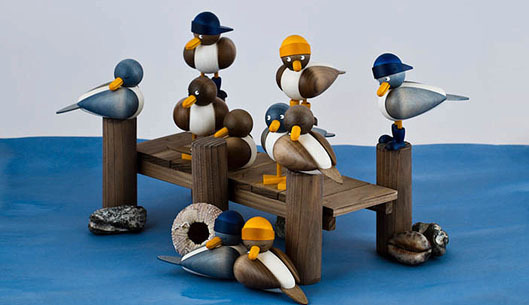 These whimsical handcrafted seagulls are just the thing for the nautical-lover in your life. 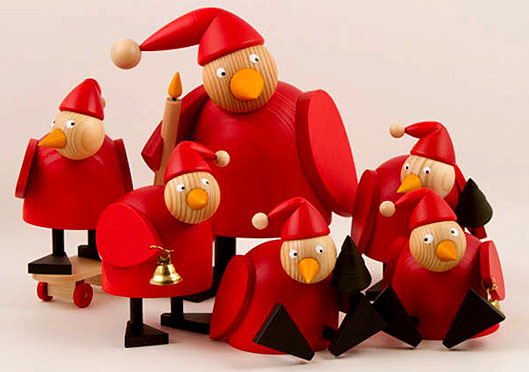 These whimsical Christmas Chickens were awarded the Tradition & Form Design Prize in 2002. Click on each image for more information. 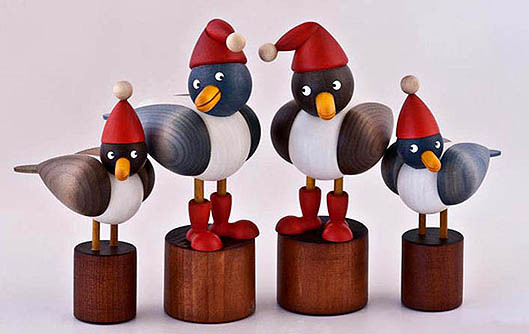 The heads and wings of these handcrafted birds can be moved to reflect various moods, such as happiness, sadness, or simply "leave me alone," and are perfect as a gift for a birthday, Valentine's Day or for any reason. They are available singly (male or female), or together as pairs. Owls are a traditional symbol for cleverness and wisdom. 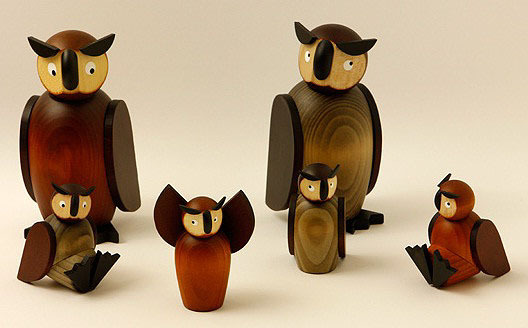 Click on each image for a larger view and more information about these handcrafted owls. These small bears are a great way of wishing someone "Good Luck!"